When Vimala cooks, everybody eats. If you’ve been to Vimala’s Curryblossom Café before, you probably already know one of the core tenants of the restaurant. Those words close a statement found on a sign in front of the café, the full text being “Nobody turned away due to lack of money. Food is a human right. When Vimala cooks, everybody eats.” That sentiment carries extra weight in light of the café providing food and refuge for those who need it most and its proprietor’s willingness to speak out on behalf of victims of domestic violence. 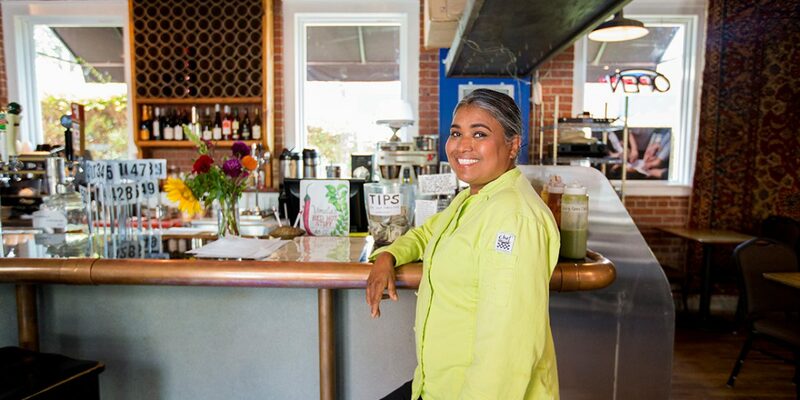 “The way I socialize on a regular basis is that, this being my culture, is that I offer my food,” said Vimala Rajendran, the owner of Vimala’s Curryblossom Café. The café has won Chapel Hill Magazine’s “Best Indian Food in Chapel Hill” award and consistently placed as a finalist in “Best of” and “Reader’s Choice” polls in Indy Week’s “Best of the Triangle” awards. It’s a fixture in the community, as is Rajendran herself. The café sources many of the ingredients used locally from a host of collaborators and even the Carrboro Farmer’sMarket. In December 2010, ground was broken to create a “kitchen garden” for the restaurant and provide a convenient composting outlet for kitchen scraps. Rajendran is from the Kerala region in the southern tip of India. She came to Chapel Hill to raise her family in a good environment – one with a diverse community with a thriving arts community, relatively diverse neighbors and good schools. According to Rajendran, the behavior of offering guests food before helping yourself demonstrates part of her culture. Culture is personalized and defined by each person as they see it. Over the past three decades, Rajendran’s experiences have helped define hers just as much as the traditions and behaviors that were passed down to her. Vimala shares her culture through her passion for food. Not just through the joy of preparation of the pleasure in consuming, but in the act of sharing sustenance and experience with others. “I just found out that someone who was picking on my daughter for what she brought to kindergarten lunch years ago now sends their child our food for their lunch,” said Rajendran.